ONLINE CLASS REGISTRATION : Save time and energy that could be better spent dancing by registering for classes online. No need to bring a checkbook to class anymore! STAY INFORMED : Always know what's going on in Augusta! Join our mailing list. 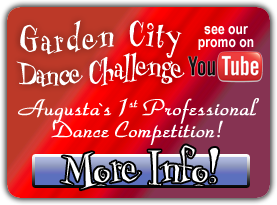 OTHER DANCING EVENTS : Visit our calendar to find classes and events in the area. Make sure you check out what's going on NEXT MONTH!. We are pleased to announce our affiliate program. The affiliate program is a perfect way for studios to raise money for scholarships and awards while also providing a discount to their students. It's very simple: as an affiliate you would receive a percentage of qualifying sales made by your students, and they receive a discount on qualifying purchases. Only a few items in the boutique aren't part of this program, so get ready to start saving money for your students and earning money for your studio! Contact Teena for more information and to get started. Come in and see Teena Marie and the friendly staff at Ballroom in Motion for their specialized instruction and the next time your honey asks "do you want to dance" you can say I DO ! For a limited time, Ballroom In Motion is offering free one-week and two-week lesson packages to new students.